Originally, Garden City, Kansas, was authorized as a British Operation Training Unit. All plans, requirements and cost figures were drawn up; however, before actual construction started, this project was canceled. Plans for the construction of an Army Air Forces Basic Flying School at Garden City, Kansas, were then drawn up, and construction began on August 7, 1942. Actual training began at this station with the activation of the Aviation Cadet Detachment on January 14, 1943. The initial type training was pilot training for basic students. Upon the arrival of a new class at this station, 80 students were chosen for training in UC-78 aircraft, and upon graduation were sent directly to Brooks Field, Texas, to pursue training in B-25 aircraft. 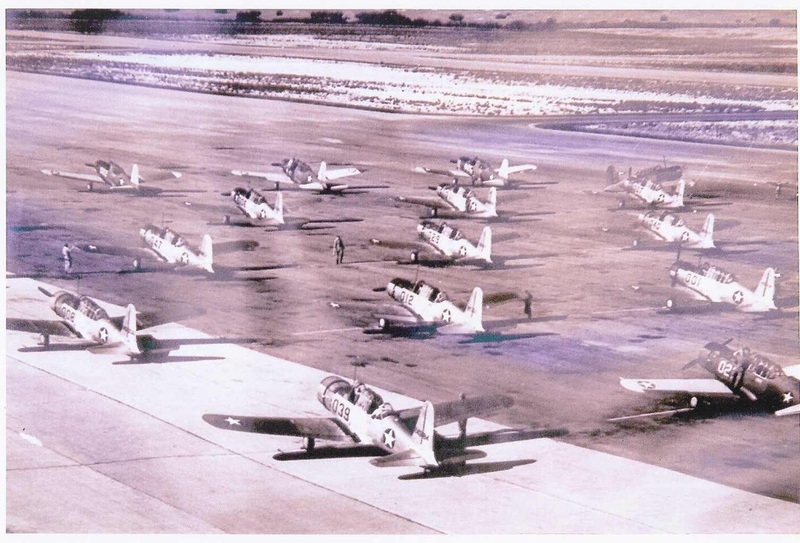 These eighty men received five weeks training in a BT-13A aircraft and five weeks training in a UC-78 aircraft. As early as June 1941, Mr. Ben Grimsley, Secretary of the Garden City Chamber of Commerce, sent an elaborate booklet containing all the advantages of locating a flying school in Finney County, Kansas, to Mr. R. H. Rhoads the Kansas Industrial Development Commission Representative in Washington, D.C. This booklet contained pictures of the area, water resources, weather conditions, facts on the abundance of natural gas, and all the other information that would influence the location of a flying school in Finney County. In fact, all of the members of the Kansas delegation in Washington, D.C. then began to present information to the War Department over a period of eighteen months before any air bases were located in Kansas. This resulted in a great amount of data being filed with the War Department. It was the cumulative effect of all the evidence presented by the Kansas delegation and the government surveys, which finally caused the War Department to establish a flight school in Finney County. This original airport site was approximately 9 miles east of Garden City on US Highway 50. General Ryan saw this site, but on driving further east he saw a site 12 and ½ miles east of Garden City and remarked that the draining terrain was much better than the proposed site. This was to be the site for the Army Air Forces Basic Flying School in Garden City. This location is still in use today as the Garden City Regional Airport. The Garden City Airbase was operated by the Government until February, 1948 when the base was awarded the property of the City of Garden City. Transfer of the former training base included 1590 acres of land, 341 buildings, miscellaneous equipment and a spur railroad track into the site. Today the Garden City Regional Airport serves as an important part of the infrastructure of southwest Kansas. The Garden City Regional Airport supplies the area with affordable air travel options on American Eagle airlines, the regional affiliate for American Airlines. American Eagle offers southwest Kansas two daily departures from Garden City to Dallas/Fort Worth on an Embraer 145 aircraft. Since American Eagle has supplied air service for southwest Kansas the Garden City Regional Airport has seen extensive growth in the number of passengers utilizing the airport. In 2011, the Garden City Regional Airport had a total of 11,500 passengers depart from the airport. In 2012, after American Eagle service began, the airport saw its passenger numbers climb to 18,000. The Garden City Regional Airport plans to continue this service with American Eagle airlines to provide southwest Kansas with a reliable and affordable travel option and hopes to see continued growth and utilization of the airport by the citizens of southwest Kansas.